There should be no mystery with harvesting cucumbers. When the cucumber reaches the "mature size" specified on the seed package, it’s time to harvest. If you wait too long, the skins get thicker and the seeds, and seed cavities, enlarge at the expense of the flesh of the cucumber. 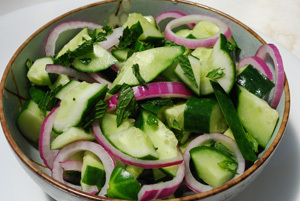 Cucumber stems are tough, so harvest by cutting, not pulling from the vines, to avoid damaging the vines. In general, harvest cucumbers as you would summer squash: while the skins are still tender, before the seeds are too large. Like summer squash, continued harvest before seed set encourages continued flowering and fruiting. 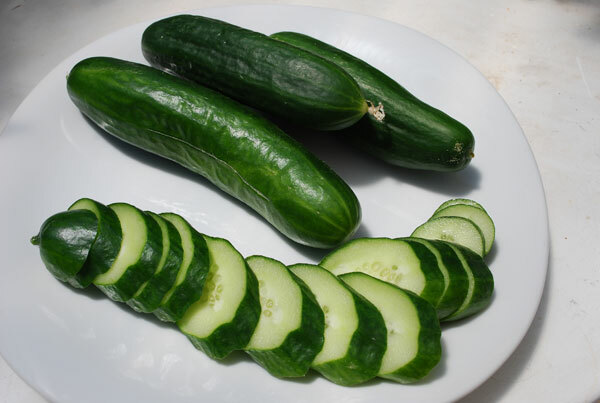 Harvest green cucumber varieties before they turn yellow. Green cucs that have “gone yellow” are more bitter, and have thicker peels. Cut the cucumbers into bite-sized chunks. Small cucumbers can be cut on the diagonal into thick slices. 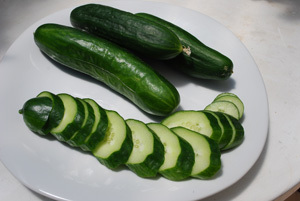 Cut larger cucs in halves or quarters and slice diagonally. 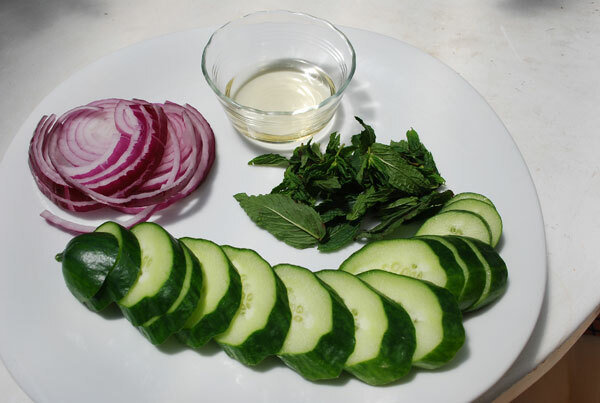 Slice the onion thinly, chop the mint, and mix the three ingredients. In a small bowl, dissolve the sugar in the vinegar, and add fish sauce to taste. Dress the salad. Serve chilled.